Due to a significant gap in the BBC archives there are currently 97 lost episodes of Doctor Who. Original scripts and telesnaps (photographs taken of the TV as the show aired) exist, along with a few clips but most of the original footage is lost forever. Fortunately, as the show was being broadcast live avid fans at the time recorded the audio of these episodes through their televisions. 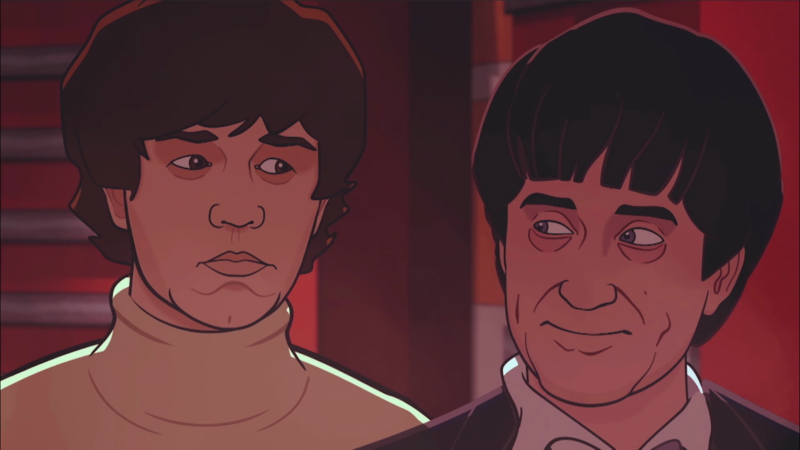 Previous animated restorations by the BBC have included The Power of the Daleks and Shada, which were enjoyed by an ever-loyal fan base who have been left wanting more. In a bid to give the fans what they want Paul Hembury Executive Producer at BBC Studios appointed Director/Producer Charles Norton to lead a new production, enlisting the previous pre-production team of character designer Martin Geraghty, storyboard artist Adrian Salmon and CGI animator/ compositor Rob Ritchie. After creating an initial animation test, Sun & Moon were commissioned by BBC Studios to help re-imagine The Macra Terror, a missing four-episode serial of Doctor Who from 1967 starring Patrick Troughton as the Second Doctor. have FUN…before they CRAWL all over you!!! Armed with storyboards, character designs and the fantastically characterful original audio, we wanted to bring a level of performance and character as yet unseen in previous animated restorations. With an illustrative graphic novel art style, we began our search for a way to allow our animators to not worry about line placement and just be able to concentrate on the acting. Utilising Toon Boom Harmony’s “Master Controllers” we were able (after a lot of fiddly rigging!) to animate complex rigged 2D characters at the touch of a button. Our rigs gave the animators full 360 degree rotation of the head, body and feet while also being able to manipulate the eyebrows, eyes and mouth. This allowed very quick, accurate and subtle posing of all the characters and delivered consistent and smooth animation. Filming live action videos (LAVs) for many of the shots, we were able to capture and reference subtle and naturalistic performances like the dart of a pupil, the twitch of an eyebrow or the tilt of a head. We reveled in the chance of delivering an authentic performance and added a level of consideration to the acting that the original episodes wouldn’t have had the time for, being shot like a stage play and rarely stopping for a retake. As well as enhancing subtle close ups, the LAVs were fantastic reference for the explosive moments too! With a team of 18 people, including 12 animators, we completed nearly 100 minutes of animation in seven months, delivering 90 shots per week at one point! We thoroughly enjoyed our dive through time and space. Initial reviews, including four stars from The Guardian, have all declared that there has been a significant evolution and fans are in for a real treat. The opportunity to contribute to this cornerstone of British culture has been a dream come true (especially for Sam) and the team’s SteelBook Collectors Edition Blu-Rays all take pride of place on our respective mantelpieces.